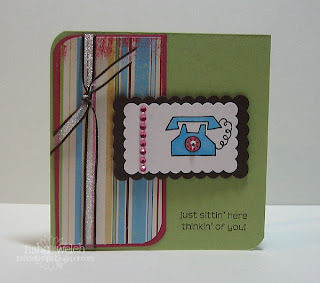 bitter sweet stamping: Call Me!! Does everyone have that one friend that no matter how hard you try, you just can't get in touch with?? My friend Stephanie is that person for me! We live two time zones away from each other, her cell phone is never on, she doesn't have a home phone, and she doesn't have email!! We just live in 2 different worlds - until recently, she lived in a house with a generator and no running water!! There are times when I am ready to pitch my -100%-connected-you-can-always-get-in-touch-with-me-and-I-can't-ignore-a-ringing-phone life, and just go live in the mountains with Steph, but alas, life (or someone) calls! So, this card is for Steph - I thought this might be the only way to get a telephone in her hands!! Details: Stamps by A Muse, CS from my stash, PP from the monster pack from Costco whose maker I can not remember this early in the morning!, bling & ribbon from A Muse!